M(i)s Ch(i)ef™: Game for Jamie! Me and Jamie! See we have this game. Jamie writes cookbooks with a time limit and show me how to make them on TV and I try to match his time. I am sure it's a game you've played before too! 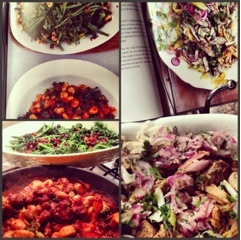 Jamie makes these stunning meals in such a short time. My goal is not only to get them done in a similar time, but make them look as close as possible to his version! And sometimes, I am pretty darn close. The other day I beat all my records (but not Jamie's) and cooked his 30 min roast beef in 40 minutes. Pretty good since the kitchen didn't look like a hurricane had been through it. We're down to 25 ish mins for his 15 min dishes. Quite impressive really, considering we would spend 25 mins faffing about with a salad if not under the pressure of the clock. What I love most about Jamie's dishes are the family style rusticness of them and even though I don't have the crockery to match, I think I do a good job. I'll hone my skills and be an expert one day but by that time, he'll probably have released a 5 min meals version to contend with! I haven't timed myself when cooking Jamie's 30 or 15 minute meals, but know it is definitely tricky. Good on you for cutting your time down so well!